Before I start this review I want to say that Triangle Studios were so nice to give me a key for Bug Butcher after I approached them. I did my best to stay objective but I believe it is good practice to state if you gotten a game from the developer/publisher for free. Bug Butcher is 2D scrolling shoot em up with enemies coming(mostly) from above. In the game you get in the role of Harry, your friendly (badass) neighbourhood bug exterminator. You are hired by a group of desperate scientists who are almost over run by giants insects. The game is composed of 30 levels with 5 bossfights each of which will test your ability to adapt, kill and survive to the maximum in the dangers which Bug Butcher has prepared for you. The sentence above pretty much sums up the whole Bug Butcher, but here I want to mention few things beside game mechanics and gameplay. First of all the look of the game. I have never imagined that something so cartoony can be so horrifying. Graphically Awfully Nice have achieved great combination between funny and cartoony and bizarre and gruesome. And only one more thing between continuing with the fun stuff. 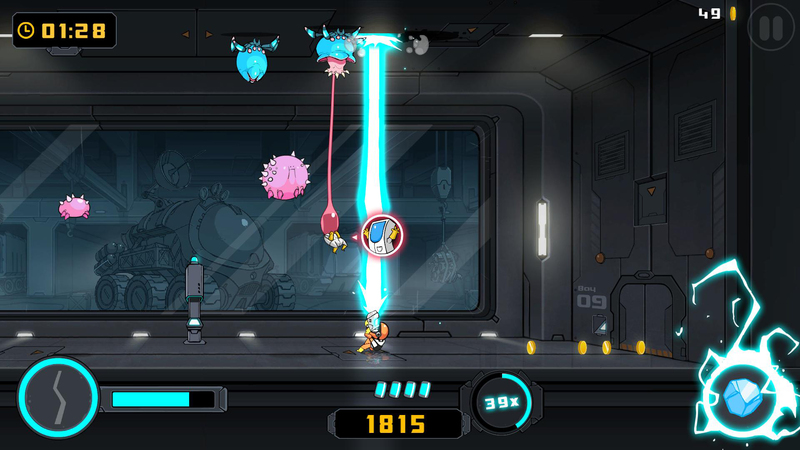 Bug Butcher is action/chaos packed game in which you will run left and right non-stop and in such games controls are really important. Thankfully they are not overlooked and are tight and responsive. The game supports game pads and while I am not fan of them most of the time here I will suggest you to use one as it is simply more comfortable than the keyboard. "I am defenseless, you must protect me..."
They bounce in from all sides! 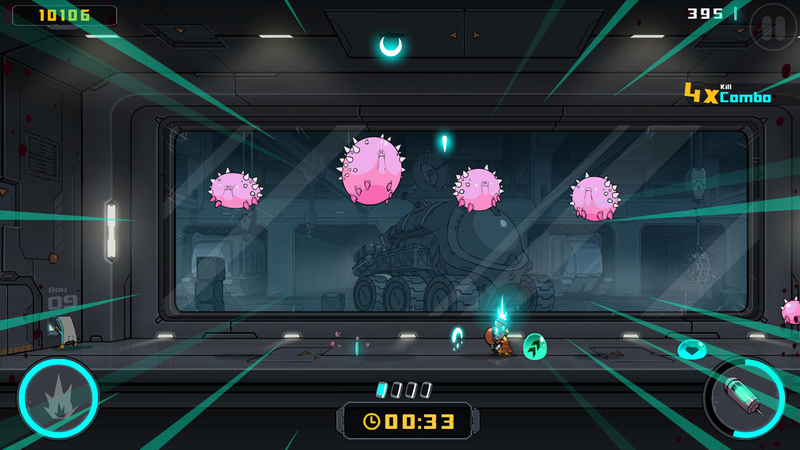 Usually in shoot em up enemies come always from one side and do not have complicated movement patterns(there are some exceptions). This is not true with the case of Bug Butcher. At the start the insects will always drop from the ceiling but with levels passing they will start appearing from the floor and walls. And they will not only fly in, they will start to bounce all around the place! This will force you to be on the move constantly calculating where they will drop if you do not want to be the one who is squashed. 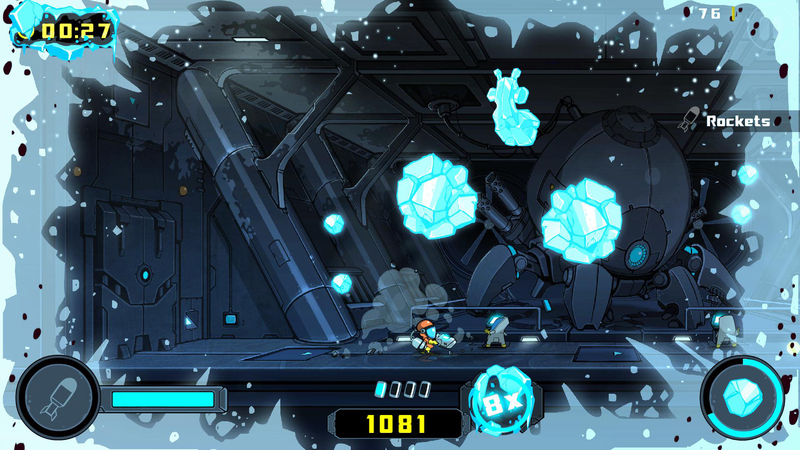 The problem won't be the huge amount of enemy projectiles, but the amount of enemies on the screen. Speaking about the enemies Bug Butcher offers ridiculous amount of different all horrible bugs which try to kill you. They split in smaller ones, puke smaller bugs, shoot lasers, follow you around, stomp you, burn you and many more horrible things. Each new bug has its own unique design and model. I personally quickly started to give them names and hate most of them for in different combinations they are absurdly deadly and unleash unspeakable chaos on the screen. This combined with the ever becoming more hazardous levels will test your skills to the maximum. Now that you know how horrible are the enemies it is time to see how awesome are the weapons. Harry(you) like two things the most - killing bugs and killing bugs with devastating guns! 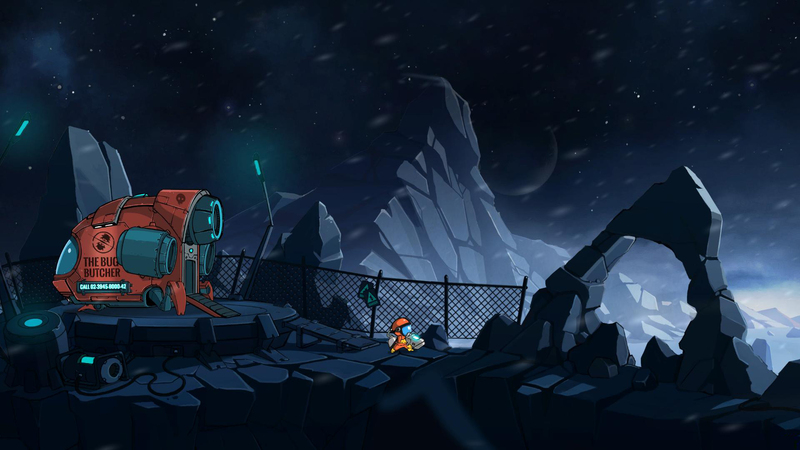 After every few levels you will unlock new power ups for the scientist to spawn for you including mini guns, rocket launchers, devastating, zapping guns and more. Aside from those the bugs will occasionally drop life, bonus damage or movement speed buffs which will often give the little you need to survive the last two or three nasty hoppers. Behind Awfully Nice Studios and Bug Butcher stand two veterans from the industry and this is obvious from the start. Bug Butcher stinks of finished and polished product. The developers did not only had great idea what they want to make but they also executed it perfectly! 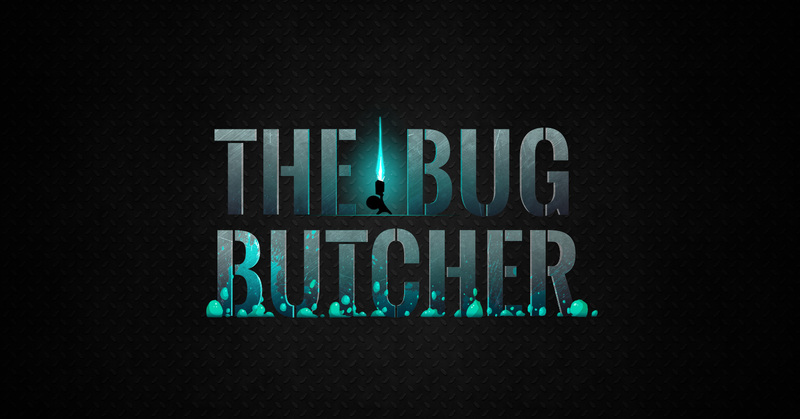 If you are into shoot em ups then Bug Butcher is a 100% for you. It has everything you might be looking for from the nasty enemies through the chaos caused by huge amounts of enemies and hazards to the badass, over the top weapons and cheeky humour. And if you think its not chaotic and crazy enough when you play alone you can jump in the co-op and enjoy double the amount of bugs! Публикувано от Sharki в 23:24 ч.